Bacon flavor embellishes different types of dishes with its smoky, meaty flavor. It's sure to have a dominant force in whatever you combine it with. 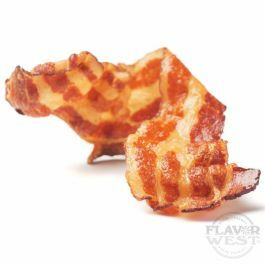 Type: Bacon flavor Water Soluble Flavoring. Ingredients: Natural and Artificial Flavoring, Propylene Glycol, Ethanol and Water. USP Kosher Grade Flavoring. Usage Rate: 15-20% for E-use. Flavor suitability: Desserts, pastries and baked treats, yogurt, ice cream, candy and more. Specific Gravity: 1.05 No Refunds on Flavoring.